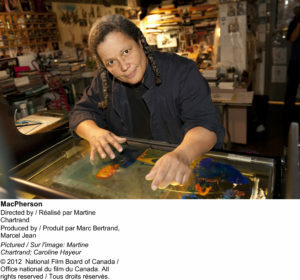 Born in Montreal, Martine Chartrand completed a BFA in Visual Arts at Concordia University in 1986, and a certificate in Art Education from the Université du Québec à Montréal in 1988. She worked as a painter/illustrator and became involved in animation in 1986, working as a layout and colour artist. In 1992, she directed the award­winning short T.V. Tango, her first animated film, for the NFB. In 1994, she received a grant from the Conseil des arts et des lettres du Québec and from the Canada Council for the Arts enabling her to study in Russia under Alexander Petrov, a master of paint­-on-glass animation. During her stay, she helped Petrov prepare and translate his film proposal for the animation project The Old Man and the Sea. In 2000, she made her second NFB’s film, Black Soul, a paint­-on­-glass animated short that traces the memory of Black History. The film has won 23 awards, including the Golden Bear in Berlin in 2001. Her third film, MacPherson, inspired by the song by Félix Leclerc, is a paint-­on-glass animated film bursting with poetry, History and musical diversity. MacPherson won the First prize and The Best Canadian Short Film public award, at he Montreal International World Film Festival in 2012.